Directions for Use: Shake thoroughly before using Hold can upright and spray about 9inches (23cm) from the surface. Apply a light film and polish to a shine with a soft cloth immediately. 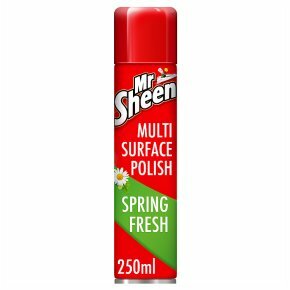 For small or difficult areas, spray Mr Sheen directly onto cloth. Not suitable for use on un sealed or waxed wooden surfaces. On antique/fine furniture, we recommend you consult a furniture specialist before use.